Kyle Vernot of Wauseon turns the corner in the 1600 meter run Saturday at the OHSAA State Track and Field Championships in Columbus. He would make the podium, finishing fifth with a time of 4:20.83. Julia Smith of Swanton clears the bar in the Division III girls high jump Friday afternoon. She secured the state title after clearing 5 feet, 7 inches. 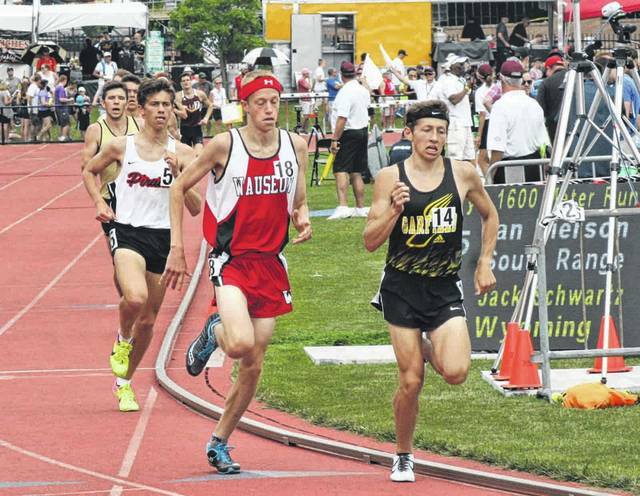 Joshua Lowry of Wauseon finished seventh in the 3200 meter run Saturday. Pettisville’s Elizabeth Sauder, center, competes in the Division III girls 1600 meter run. She finished sixth with a time of 5:06.27. COLUMBUS – Fulton County crowned a pair of state champions in Division III and had various others make the podium at the OHSAA State Track and Field Championships which wrapped up Saturday at Jesse Owens Memorial Stadium on the campus of the Ohio State University. On Friday, Julia Smith of Swanton won the high jump in Division III. The next day, Dakota Stamm of Archbold took home the title in the 400 meter dash. The Swanton girls finished in a four-way tie for ninth with 20 points. Archbold tied for 20th with Lima Central Catholic and Lehman Catholic, all three at 11 points. Both Stamm and Smith had placed in their respective event multiple times, and in Smith’s case, she is now a four-time state placer. Smith won the event after clearing 5 feet, 7 inches on her second attempt. Lyssi Snouffer of Delaware Christian, who finished second, bowed out at 5-7. The senior even had to wait out a lightning delay which lasted over an hour. Nevertheless, it did not stop her from reaching her goal. “I had the number one seed coming in. I think through all divisions. And I didn’t let that get in my head,” she said. “I didn’t let any of my bad jumps this season get in my head. In the 400m, Stamm beat out last year’s state champion to win with a time of 56.4. Lynsey Shipley of Portsmouth took second (56.8). After finishing runner-up in 2017, her eyes were on the top prize this season. She set a school record with her time, and undoubtedly ran the best race she could. The Bulldogs got another high placement in the girls discus where Sidney Taylor took third with a throw of 133-6. Swanton’s quartet of Bobbie Oberle, Haley Nelson, Brooke Oberle and Bridget Harlett placed fifth (50.62) in the 400m relay. 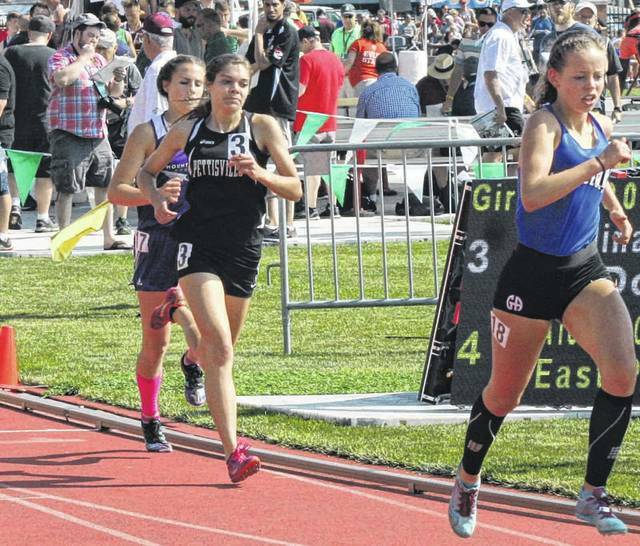 The Bluestreaks added an eighth place finish (9:43.83) in the 3200m relay consisting of Kylie Sauder, Brittney Ramirez, Gwynne Riley and Stamm. Pettisville’s team of Elizabeth Sauder, Nichole Foor, Kate Stuber and Morgan Leppelmeier placed fifth (9:37.85). Elizabeth Sauder would garner a podium finish for the Blackbirds in the 1600m, taking sixth (5:06.27). She was around eighth with a couple laps remaining, but was able to move up a couple before the end of the race. She also competed in the 800m where she finished 13th (2:23.29). All in all, it was a great end to her track and field career. Foor was 12th (5:19.78) in the 1600m and 11th (11:45.47) in the 3200m. The lone boy to make podium in Division III was Hunter Tresnan-Reighard of Delta in the discus. He finished eighth with a throw of 148-1. 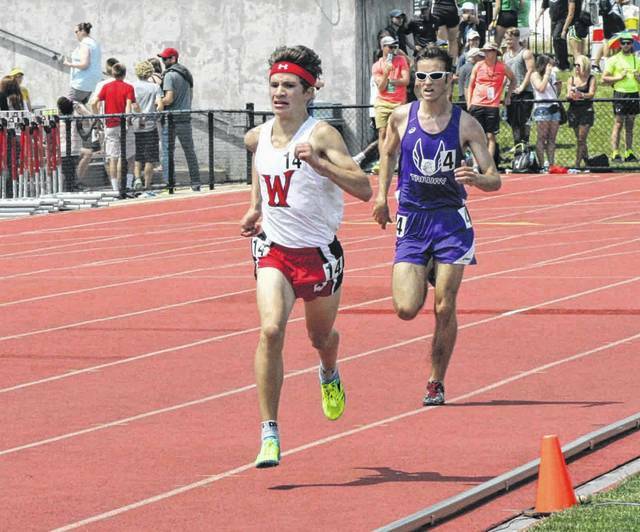 After just missing the podium as part of the boys 3200 meter relay Friday, Wauseon’s Kyle Vernot and Joshua Lowry would not be denied in their individual races Saturday. Vernot, competing in the 1600m, got fifth with a time of 4:20.83. The key for the senior was simply sticking to his gameplan. Lowry placed seventh in the 3200m, running a personal best time of 9:41.76. The junior outlasted Nich Michels of Triway who finished eighth (9:42.71) and Kyle Lethander of Oakwood who took ninth (9:43.7). He was just outside the top eight for much of the race, but pushed through and got the job done. “Quite honestly, at about 600 (or) 700 (meters) to go I didn’t think I had it. I knew where I was,” said Lowry on just making the podium. “I knew that if I wanted to get seventh or eighth, I had to be either first or second in that clump right there. I didn’t really think I had it, but then I started thinking to myself, this is my last race of the season. I’ve worked really hard to get here, I might as well try. So I just kind of started giving it more than I thought I had. However, Lowry admitted he was even more happy for Vernot, someone who played a huge role in his development. The aforementioned 3200m relay of Lowry, Owen Newlove, Michael Cheezan and Vernot finished ninth (8:06.33). Wauseon tied for 31st as a team with six points. Another barely missing the podium was Swanton senior Anthony Howard in the 800m. He finished ninth at 1:56.47.